John and his wonderful wife have been friends of mine since we first met. They are an amazing family and run a company anyone would love to work for. Today, John shares tricks, tips, and guidance on how to deep fry a turkey. And he should know, he invented the indoor turkey fryer! 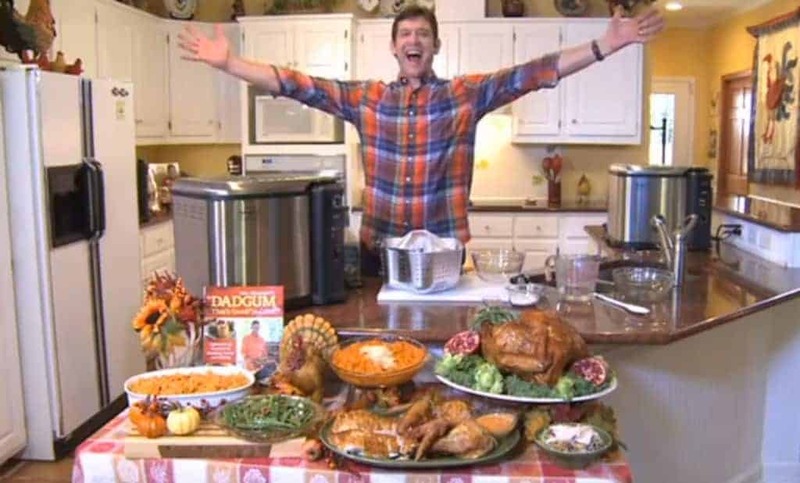 Get the recipe for John’s Buffalo Ranch Turkey below! Thaw turkey, if frozen. To properly thaw a frozen turkey in the refrigerator allow approximately 24 hours for every 4 pounds. Fill deep fryer with 2 gallons of oil and heat to 375°F. Remove giblets and neck. If present, remove and discard plastic leg holder and pop-up timer. Rinse turkey thoroughly with warm water or completely cover with warm water and soak for no more than 30 minutes to ensure cavity is free of ice. Whisk together water and dry ranch seasoning to make marinade. Using a marinade injection syringe, inject 1/2 cup (4 ounces) marinade in each breast. Inject 1/4 cup (2 ounces) marinade into each leg and thigh. Fry turkey for 3 to 4 minutes per pound. Lift the basket from the hot oil slowly. Insert a meat thermometer in the meaty part of the breast; turkey is done when it reads 165°F. If the turkey is not done, lower it carefully back into the oil for an additional 5 minutes. Once the turkey reaches the desired temperature (minimum 165°F), remove from oil. Allow the turkey to rest and drain in the fryer basket for about 10 minutes before removing for carving. Serve with buffalo sauce. Mix ranch dressing with buffalo sauce. Season with dry Cajun seasoning to taste. Makes a great dipping sauce! 5 Great Dessert Recipes From My Visit With Sister Schubert! Love me some deep fried turkey but I love the old fashioned roasted turkey the best! Happy Thanksgiving to you, Donna Sue!!! This recipe sounds delicious. I love listening to both of your awesome accents, too! Happy Thanksgiving! Christy, wishing you and your family a wonderful Thanksgiving!! I sure am thankful for you, your website, and your books! Happy Thanksgiving to all the readers and posters on Southern Plate!